Cadillac - American manufacturer of class "luxury" car, owned by General Motors. Cars "Cadillac" are sold in more than 50 countries and territories, mostly in North America. Currently, "Cadillac" second oldest American automobile manufacturer after the "Buick" and one of the oldest automobile brands in the world. 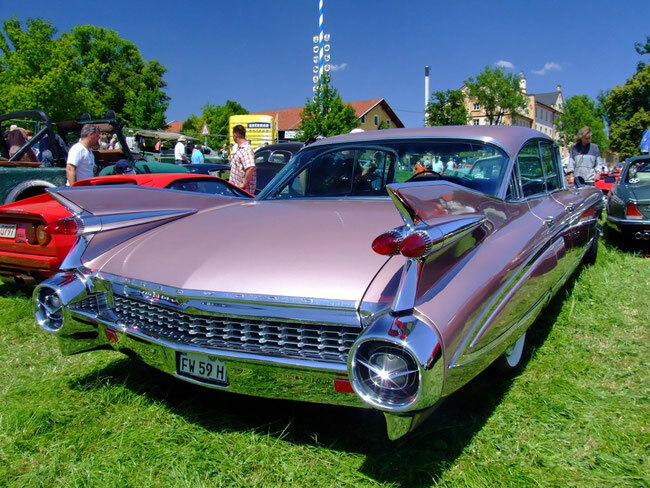 Depending on the evaluation criteria, "Cadillac", perhaps older than the "Buick"; Nevertheless, after the elimination of "Oldsmobile", "Buick" is often called the oldest remaining manufacturers in the United States. "Cadillac" was founded in 1902, at the dawn of the twentieth century. Its founder, Henry Leland, chief mechanic and entrepreneur, named the company after his ancestor, the founder of Detroit - Antoine de Lamothe-Kadilyaka. Mainly sold in the United States and Canada. Cadillac is currently using the slogan: "Life, Liberty and the pursuit", in connection with the inalienable rights mentioned in the Declaration of Independence. Since 1909, car brand "Cadillac" belongs to «General Motors». 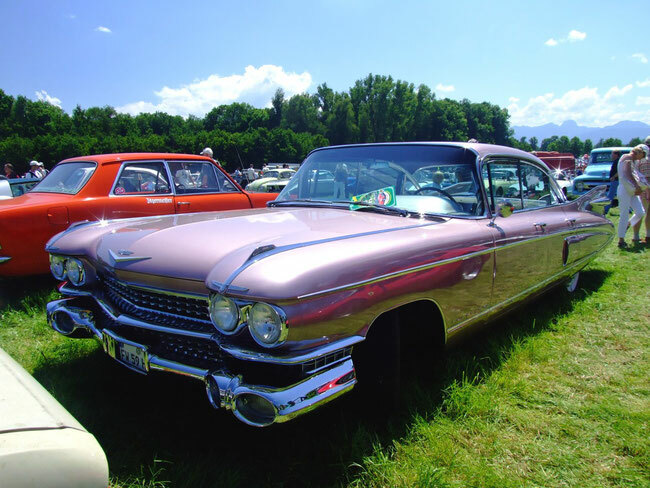 In the six years before that "Cadillac" laid the foundations of modern mass production of automobiles by demonstrating the complete interchangeability of its precision parts and proved itself the very first American brand of high-end machines. It is also inspired by the logo of the company, which is based on the arms of A. Kadiyyaka. "Cadillac" has developed many automotive devices and accessories, including complete electrical system, unstressed manual transmission and the steel roof. Under a "Cadillac" brand three engines have been developed, one of which (the V8 engine) set the standard for the American automotive industry. As a result, Cadillac became the first American car to win the prestigious Dewar Trophy race at the Royal Automobile Club of Great Britain and the slogan "standard for the whole world." The founders of the firm "Cadillac" - the engineer on the exact vehicles Henry Leland and entrepreneur William Murphy. Henry Leland worked as a mechanic at an arms arsenal in Springfield during the Civil War. He then became a mechanic, designer at the "Brown and Sharpe» (Browne & Sharpe). After moving a plant in Detroit this entrepreneur founded the company "and Leland Faulkner» (Leland and Faulconer), which was engaged in casting and metal stamping, produced car engines and chassis components. "Cadillac" was formed on the ruins of "Detroit Automobile Company", which, after being out of it in 1902, Henry Ford left and several of its key partners, went bankrupt and be liquidated. For the liquidation of the company's assets financial backers Ford, William Murphy and Lemuel Bowen (William Murphy and Lemuel Bowen) appealed to the engineer Henry M. Leland and production company "Leland Faulkner and" to evaluate the plant and equipment prior to sale. Instead, Leland persuaded them to continue the automobile business using Leland ready single-cylinder engine. With the departure of Ford needed to change the name of the company, and August 22, 1902, the company was renamed as "automobile company Cadillac» (Cadillac Motor Car Company) after the French explorer and colonial administrator of the XVII century by Antoine de La Mothe Lome-Kadilyaka, in 1701 founded Detroit. From the earliest years of its existence the company "Cadillac" strove for precision design and elegant luxurious decoration to its cars compared with all the finest in the United States. In 1908, an important innovation was the use of interchangeable parts. "Cadillac" was the first manufacturer to run a series of totally enclosed car taxi in 1910, and in 1912 became a pioneer in the use of a single electrical system, which included a starter, ignition and lighting. In 1928, Cadillac introduced the first silent synchronized manual manual gearbox utilizing constant mesh gears. The first automobile air-conditioning has also been installed on the Cadillac had cooling capacity of 370 watts, and was created by "C & C Kelvinator Co» in 1930. In 1927, Cadillac introduced the body design development (as opposed to the projected designers). Since 1926 began to be installed shockproof triplex. Cadillac also introduced the first all-steel roof of the passenger car. Previously, car roofs were made of wood. In 1948, the wings of the body has been supplemented by decorative "fins". The Eldorado Bruem 1957 feature "seats with memory" has been proposed, allows you to store and recall settings for the seat of different drivers. In 1964, the first fully automatic heating / air conditioning was provided, allows the driver to set the desired temperature is maintained by "climate control." Since the end of 1960. Cadillac offered a fiber driver warning system refusal bulbs. Airbags for the driver were installed on some models of Cadillacs from 1974 to 1976. The first relatively massive car with a V8 engine was the Cadillac models in 1914. The engine had a volume of 5429 cc and was lower valve, in the first year was released about 13 thousand Cadillacs with this engine. In 1915 the company introduced a V8 engine with the collapse of the cylinder 90 ° 70 hp (52 kW) at 2400 rev. / Min and torque of 240 Nm (180 ft-lb of force), which allowed its vehicles to reach the speed of 65 miles per hour. It was more than tolerated by the majority of the then roads. In 1918, Cadillac introduced the first two-plane crankshaft for the V8 engines. In 1930, Cadillac developed the first V16 engine with overhead valves spaced at 45 °, volume 452 dyuyma³ and capacity of 165 hp (123 kW), one of the most powerful and quietest engines in the United States. Development and introduction of the V8, V16 and V12 have helped to make Cadillac "standard for the whole world." A later model of the V8 engine, known as the top flap, in 1949 set the standard for the entire US auto industry. 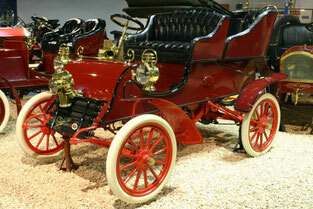 The first Cadillac was completed in October 1902 and had a capacity of 10 hp (7 kW). 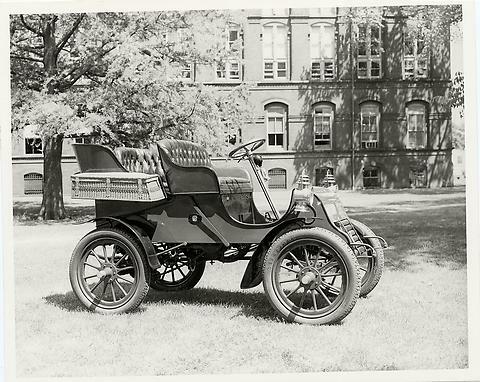 The car was almost identical to the Ford Model A 1903 Many sources call the date of the vehicle rolling out on October 17, also referred to the date of October 20 and the information about the construction of three cars to 16 October. In any case, the new Cadillac was exhibited at the New York Auto Show next January, where he impressed enough to collect solid orders for more than 2,000 cars. The greatest selling Cadillac provides high accuracy in the manufacture of parts and, as a consequence, the reliability of these machines were simply better made than its competitors. 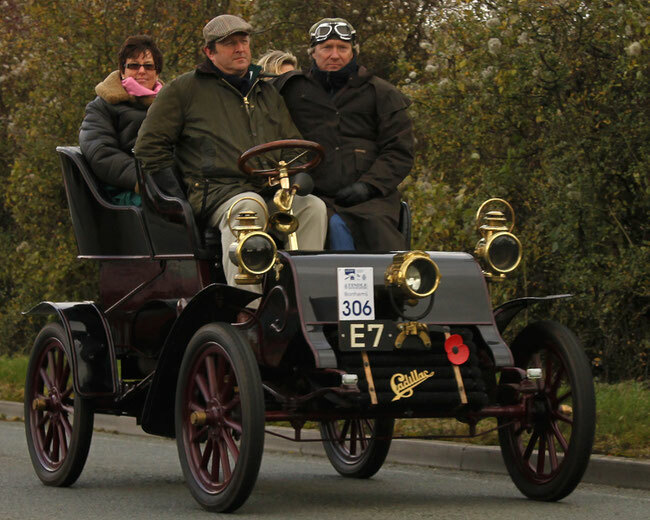 In 1908, Cadillac took part in the test for interoperability, which took place in the UK, where he was awarded the Dewar Trophy for winning the annual most important contribution to the development of the automotive industry. 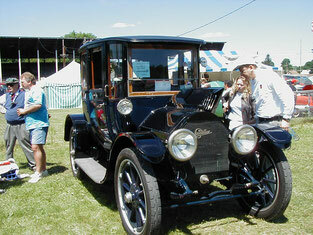 Model A was only the first successful attempt of the company, the real fame has brought her model D release in 1905. Fitted with four-cylinder engine, this five-seater had a wooden hull and, on request, aluminum trim. Production "Leland and Falconer" and "Cadillac Automobile Company" merged in 1905. 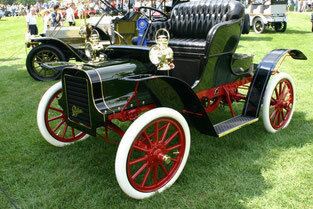 July 29, 1909 General Motors Company acquired the "Cadillac" of 5,969,200 dollars. GM President William Durant asked Leland to remain managers and manage the company as their own. "Cadillac" was the epitome of prestige of General Motors, engaging production of large class "luxury" cars. "Cadillac" brand is also automatically used by GM for "commercial chassis" special cars, such as limousines, ambulances, hearses, flower cars and funeral homes, of which the last three types are made to order shops for remaking cars. At its plant "Cadillac" does not produce any vehicles similar purpose. In July 1917, the US Army, which needed a reliable staff car after extensive testing on the border with Mexico has chosen the Cadillac Type 55 model "Touring» (Cadillac Type 55 Touring Model). During the First World War for use in France by officers of American expeditionary forces in 2350 cars were delivered. In 1922, the number of issued Cadillacs has exceeded twenty thousand. Part of such a successful sales company is required a new model of Type 61, equipped with wipers and rear-view mirror as standard. Cadillacs period before the Second World War were well built, powerful, mass car class "lux", aimed at the upper market segment. In the 1930s, Cadillac added to its range of cars with V12 and V16 engines, many of which were equipped with bodies made by special order; whereas these engines were remarkable due to the fact that they could provide the combination of high power, silky smoothness and low noise. A new era in automobile design "Roaring Twenties" was associated with Harley Earl, who founded in 1927 the first Art and Design department at a car company called General Motors Art and Colour Section. It was he who made known to all the radiator grille, which to this day is a business "Cadillac" car card. The first work of Earl in "Cadillac" has become a model of a small elegant car «La Salle», which was a transitional stage between Buick and Cadillac, and was advertised as Companion Car to Cadillac. In 1927 «Cadillac La Salle» became the car, opening the race «Indianapolis 500". Then, in this role, Cadillac made the first, but certainly not the last time. 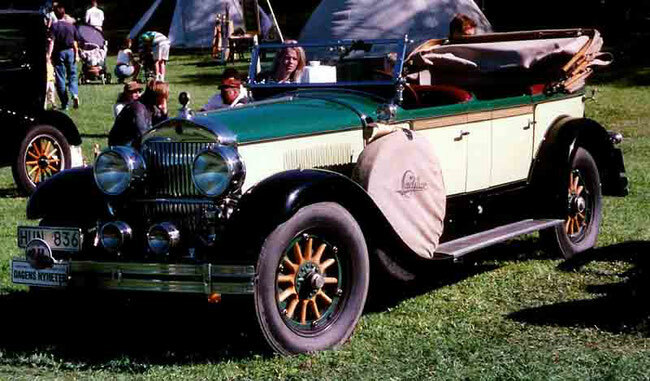 Cars La Salle still led the race five times: in 1931 (model Cadillac 370 V12), 1934 (La Salle), 1937 (La Salle), 1973 (Eldorado) and in 1992 (Allante). In the first year of release La Salle presented eleven different body styles on two wheel bases, as well as four Fleetwood project on a 125-inch (3175 mm) base. In coupe coupe La Salle was even a small door on the side and the police station, where supplies were kept golf course. In 1932, after the "Cadillac" suffered from record low sales and charges of discrimination against black customers, Alfred Sloan created a committee to consider the termination of the line "Cadillac". In the fateful board meeting, the president of "Cadillac" Nicholas Dreystadt heard that legendary boxer Joe Louis could not enter the company's office to buy a car, because he was black, and sought the aid of a white friend, that he made the purchase for him. Dreystadt spoke to the GM Board of Directors with a ten-minute speech in which he defended the rights of black consumers, to increase sales. The Board agreed to Dreystadtu 18 months period, to get the results. Cadillac managed to survive the Great Depression, as part of GM. By 1940, sales of "Cadillac" has increased tenfold compared to 1934 year. 1934 has caused a revolution in assembly line technology. Henry F. Phillips (Henry F. Phillips) introduced in the market the screw «Phillips» Phillips screwdriver and a Phillips screwdriver. He entered into negotiations with General Motors and convinced the group "Cadillac" that his new screws accelerate assembly time and due to this increase profit. 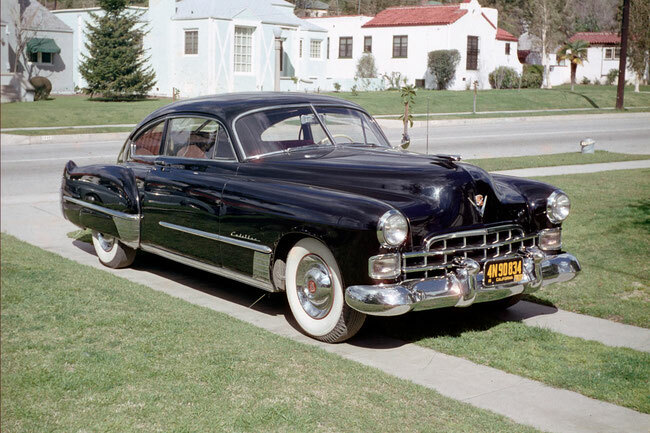 "Cadillac" was the first automaker who used Phillips technology, which was widely distributed in 1940. In 1941, the first time in many years, all cars built by the company equipped with a basic engine and transmission. In 1938, 24-year-old Bill Mitchell designed a new Cadillac 60 Special. The car combined solid appearance with a driving ease and comfort, allows owners to manage it without the help of a professional chauffeur. This model identified the design direction of the next decade. 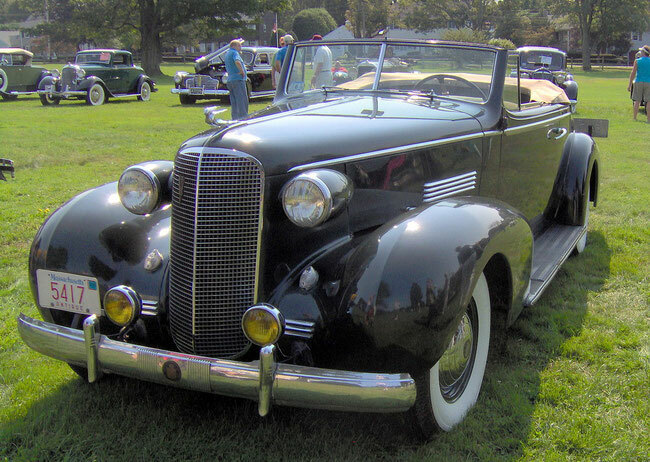 In 1941, the "Cadillac" first introduced the automatic hydraulic transmission, air conditioning system and fuel tank cap, hidden behind the rear left light signal. In February 1942 the company completely stopped production of civilian models and threw all their forces to help the front. Within 55 days of Clark Avenue factory in Detroit conveyor descended first tank M5 «Stuart." Total on "Cadillac" factories in Detroit and Michigan were produced 1470 tanks of this type. In the production of the chassis was also established during the war for self-propelled howitzers, light tanks M24 (1944) and components for aircraft engine Allison V12. Even General Douglas MacArthur used as the official car Cadillac Series 75. Cadillac 1948 with curved windshield of two halves. On cars Cadillac such windshields have appeared in 1948 model year. J. Hurley. Earle (Eng. Harley J. Earl), GM's chief designer, has introduced a host of new design elements, such as fins, panoramic windscreen, the abundance of elements in polished metal (stainless steel, and chrome), both outside and in the cabin who have been (in the late 1940s and 1950s), the characteristic features of a classic American car. Created in the years car magazine Motor Trend (Eng. 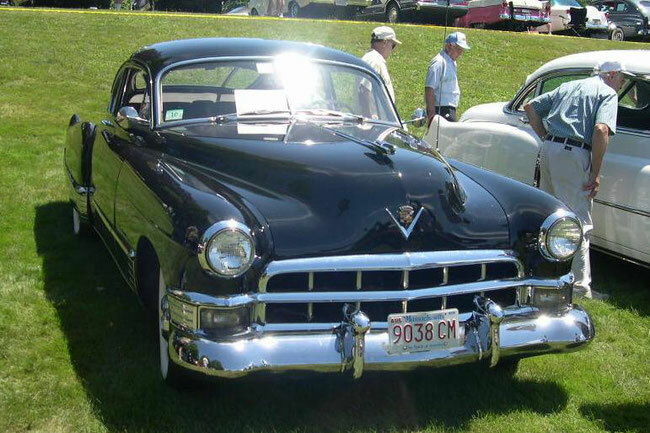 ), His first award for "Car of the Year" in 1949 awarded the "Cadillac", but the company refused it. November 25, 1949 the company was released millionth vehicle, Coupe de Ville 1950. Also set a record annual production of cars were produced more than 100 000, upheld in 1950 and 1951. The first fins (Eng. 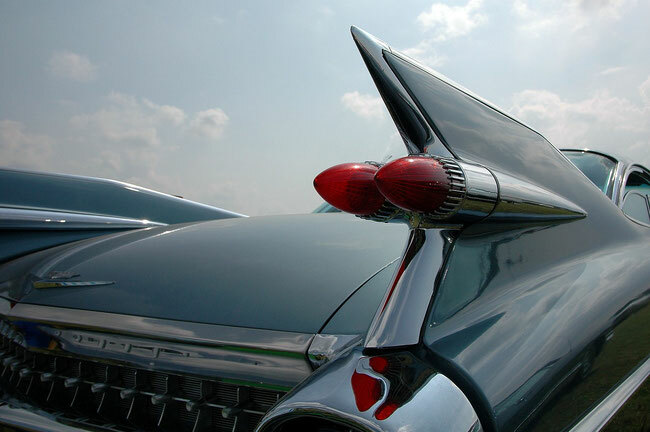 Tailfins) on "Cadillac" cars appeared in 1948 under the influence of double-girder keels fighter P-38 Lightning. 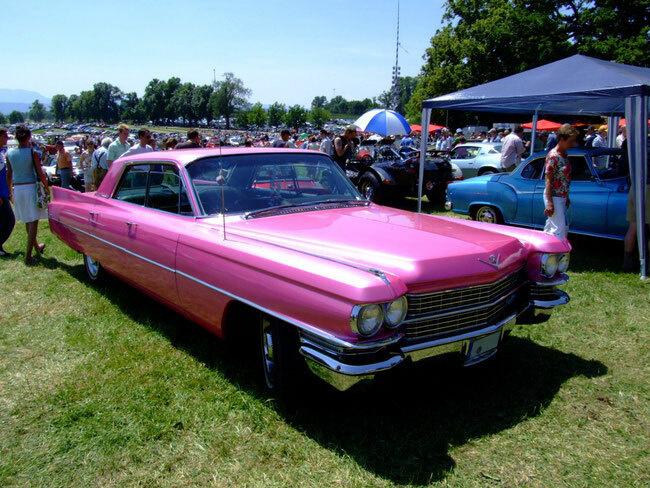 Cadillac in 1959 became one of the most recognized representatives of the era craze car tailfin. From 1960 to 1964. fins decreased in size each year and, starting with 1965 model year, it has completely disappeared (which has kept them since 1964 with the exception of series 75 1965). After 1959 the abundance of elements in brushed metal design also decreased every year, and came to naught with the 1966 model year, even when the rear bumpers are no longer fully chromed and began partially painted, as well as holes for the headlights. In 1949, the "Cadillac" has produced an even more compact, lightweight and economical V8 engine, by which Cadillac became the fastest and most powerful car of America. At the end of the decade Briggs Kaninngem came to finish the race at Le Mans tenth standard Cadillac in 1950. In January 1950, GM is hosting an exhibition «Mid Century Motorama» in a New York hotel "Waldorf Astoria". Among the cars on it was presented and Cadillac Debutante, which inspired the creation of theatrical production "Cadillac of pure gold." The company marked its fiftieth anniversary of the release of the "golden series" models in 1952. In 1953, there was a model "Bruem Eldorado", the first since the war completely new high-end car. Attempts to improve the design of Eldorado borne fruit - a new bumper Dagmar appeared in 1954 with the characteristic "fangs", named in honor of the brilliant character of television show «Jerry Lester's House Party». In the same year it began the production of seats, electrically adjustable in 4 directions. Another feature of the design of "Cadillac" was the design of its front bumper, which became known as Dagmar bumpers or simply Dagmars. Appearing after the war bumper guard in the form of an artillery shell, it was an essential part of the ensemble of the bumper and front grille complex "Cadillac". Since the yard stood the 1950s, the elements placed at the top of the front part of the body, thereby reducing their effectiveness as a bumper guard. They also became more isolated and have been associated with breast teledivy 1950 Dagmar. In 1957 the bumpers gained black rubber pads, which only strengthened the relationship between the styling element and a stylized, oversized bumper design. In 1958, the item was removed and completely absent on all models since 1959. Technical innovation this year was the use of the power steering as standard equipment of cars. Model 1957 "Eldorado Bruem" has become the personification of style "Cadillac". For it was characterized by the twin headlights and body structure without the central rack. Polished stainless steel roof gave Eldorado Bruem unique look. 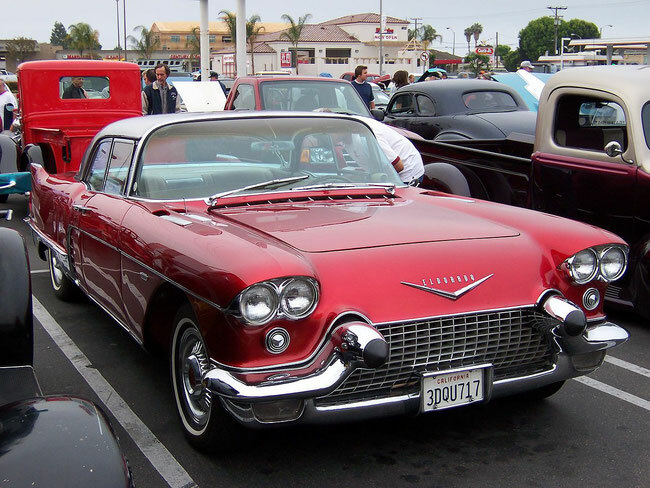 "Cadillac in 1959", designed by Harley Earl was the best interpretation of the "Jets" style in the automotive industry. This car has been the subject of cult worship of generations of Americans. In 1962, great attention was paid to the security elements, such as the headlights when you turn the backlight and dual-circuit brake actuator. In 1964 flaps - insolent finding designers - have been improved. This year "Cadillac" produces three millionth car. In the next ten years, the list of new inventions and design ideas considerably enlarged. A feature of the model 1964 was also an automatic temperature control, both for conditioning and heating. With the expectation of cold climate produced electrically heated seats (on cars 1966). In 1966, Cadillac set a record annual sales of more than 190 000 units. (Among them - 142 190 de Villes), representing an increase of 60%. This record was surpassed in 1968, when Cadillac sales mark for the first time reached 200 000 units. In 1967 the "Cadillac" released in light of radically new model - front wheel drive Eldorado - coupe class "suite" with a simple, elegant design - a distant echo of the fin and chrome excesses of the 1950s - to make Cadillac a direct competitor of Lincoln and Imperial, and in 1970 ., for the first time Cadillac has overtaken Chrysler sales. a new generation of engine with a working volume of 472 dyuymov³ (7.7 liters), which debuted in 1968 model year, is designed so that its volume can be increased up to 600 dyuymov³ (9.8 L), was increased to 500 dyuymov³ (8,2 l ) for Eldorado 1970. Transmission in the vehicle was located under the engine, and therefore the power unit had a primary chain ( "motor") transmission - a decision that is characteristic for motorcycles. In 1975 he started the lineup with a transverse arrangement of the engine. This exclusive high-end car was built on a completely new chassis. Exceptional driving performance provided dyuymov³ engine volume 427 (1968) or the V8 500-inch (1970). Appears transistor ABS Track Master, may not be driven skid. In the journal Review of Cadillac called "the most convenient and easy to manage," car among luxury brands of the German, British and American. His 70th birthday in 1972. "Cadillac" said a large number of design innovations. In July 1973 he was released five millionth Cadillac. Annual production is more than 300 000 cars. Car Design also developed and improved - on models 1974, 1975 and 1976 were introduced wrinkled body zone, absorbing the impact energy and airbags. In 1970 for the first time since the 1960s have reappeared machine memorable size, although not on such a scale. Fleetwood 1972 was by about 43 mm (1.7 inches) large wheelbase and 100 mm (4 inches) long length compared to Fleetwood 75 Series of 1960, while the entry-level 1972 Calais (Calais ) was 61 mm (2.4 inches) longer than its counterpart 62 series in 1960 with the same wheelbase. Weight gain and additional equipment required to increase the working volume of the engine before the next decade, an era of decreasing sizes. Features deteriorated after reducing power to 420 hp (297 kW) and the torque reduction of up to 75 kgm in the first year and more. From the power it had to be abandoned in 1971, and later because of reduced compression ratio required by the advent of low-octane unleaded fuel and increasingly stringent environmental requirements. Despite record sales in 1973 and in the late 1970s, "Cadillac" suffered from an illness that existed in the American automotive industry c late 1970s to late 1980s, primarily due to new government requirements for safety, noise level, and economy. If the car body of the first half of the seventies still had a number of fillets, in the second half of the decade was dominated by sharp edges and angles. Another important detail that make up the difference between the new models, steel rectangular headlights finally permitted by US legislation. There were two sizes of these lights - two large, 200 × 142 mm (7½ × 5½ inches) or four smaller 165 × 100 mm (6½ × 4 inches). The first car, a predetermined direction around the style, was Cadillac Seville in 1975, it is no accident: it was the first "compact" model Cadillac, and the company wanted to ensure that the car new for themselves the class more interior volume than the European cars of the same size, in first of all - Mercedes-Benz models. The compact Seville was introduced in April 1975 as a model in 1976 and has become the standard model for the first electronic fuel injection system developed by "Cadillac". The engine was fuel-injected version Oldsmobile 350. In May 1975, "Cadillac" has released a new "Seville", corresponding to world standards. More compact and maneuverable, this car was quite spacious inside and have better fuel economy. Standard equipment "Seville" was part of the injection system and electronic engine management. Reduced full-size cars in 1977 and Eldorado were equipped reduced to 425 inches (7 liter) V8. This engine provide good performance and fuel efficiency for reduced RWD models, but it was not powerful enough for a large El Dorado. Later the problem was partially solved for model years 1980-1981. To provide 368 dyuymov³ (6 L), again reducing the initial volume of 472 dyuymov³ (7.7 liters), as well as weight and physical volume. Like most US manufacturers, "Cadillac" was forced to reduce production volume between the fuel crises of 1973 and 1979. Its basic model «De Ville» and "Fleetwood" were reduced in 1977, and then - in 1985, when these models were also converted to front-wheel drive layout. In celebration of the bicentenary of the American "Cadillac" I presented commemorative model "Eldorado" convertible. The car was painted in 1976 in the American flag colors: all white with blue and red stripes, red and white leather seats and wheel discs with white inserts. Reduced Eldorado debuted in 1979 with the new «bustle back» Seville Sedan, the entered on the same platform in 1980 and "El Dorado" and "Seville" were further reduced in 1986 in the compact car class, with sales also shrinking. Completely renovated Seville in 1980 was distinguished by sharp edges and bold design makes it unlike any one car of America. For the first time as "Sevil" was made on the same chassis as the "Eldorado". John O. Grettenberger headed "Cadillac" January 10, 1984. He led the company the longest - 13 years. The two-door «Allante» 1987 was a unique car in many respects. Its body was designed and produced by the Italian company Pininfarina (Turin, Italy). This model was first used many technical innovations Cadillac, including the Traction Control system and the Northstar engine. The syndrome of "look-alike with a similar engine"
The syndrome of "look-alike with a similar engine» ( «Look-alike, drive-alike syndrome»), which affected most of the units under the administration of General Motors Roger Bonham Smith conceived a negative effect on the "Cadillac", because the company has tried to reduce the weight of their models. The DeVille, generally successful model for the "Cadillac", received the full processing in 1985, which made the car much more like his soplatformennika - "Buick Electra" and "the Oldsmobile 98". Due to the shortage of gasoline during the oil embargo of the 1970s and wishing to improve fuel efficiency, "Cadillac" offered for its full-size cars, produced from 1979 to 1985 Oldsmobile V8 engine, 'LF9' 350-inch (5.7 L) was used diesel fuel. Instead, as is commonly done in the industry to design a small diesel engine from the ground up for rapid response to customer demand and maintain the minimum weight of the power plant (and therefore the entire chassis), in the "Cadillac" used hastily revised version of the long and well served petrol Oldsmobile Rocket, 350 V8. two additional major bolt have also been increased to 3 inches (76 mm) main journals of the crankshaft to compensate for higher voltages, which occur in diesel engines in detail, the reciprocating motion being used. This engine quickly earned a reputation as unreliable, since followed by a wave of catastrophic failure of the engine, usually the fault of cheap components and cylinder gaskets, indicating that a certain combination of inadequate design, poor casting, machining and substandard. In general, GM had a regular quality problems because of the last two defects in a variety of interior parts of many engines and transmissions all the decade from the mid 70's to mid 80's, so that these problems are certainly not spared and diesel Olds 350. In addition, fuel system did not have an effective system of water separation, with neither buyers nor the dealer's technical services have not been properly informed about the products and procedures necessary for the proper maintenance of the engine. This led to corrosion in the fuel pump, injector, leading in turn to incorrect cycles injection, knockout cylinder head, stretching or breakage bolts cylinder head fault cylinder gasket leak in the refrigerant cylinder via the hydraulic control valve, and failure of the internal engine components and related catastrophic engine damage. Ironically, the "Detroit Diesel" - another division of GM, has to its credit a decade of successful experience of manufacture of high-quality, but much larger diesel engines. n an attempt to appeal to a younger buyers, in 1982. "Cadillac" has launched the compact Cimarron. Cimarron Section J platform with the Chevrolet Cavalier, Buick Skyhawk, Firenze Oldsmobile, Pontiac J2000, Camiri Holden, Isuzu Aska and the Opel Ascona and as expected, GM's leadership in competition with third near BMW's commercial success. As the Cimarron was rushed into production for about three years earlier than was originally available is very low-powered four-cylinder GM 122 (V6 appeared in 1985) and, at first, were made very minimal differences in style to distinguish it from the much cheaper Chevrolet version. Buyers generally ignored the Cimarron as "inflated the price Cavalier" with leather seats. Style became longer be combined with other Cadillacs in the later years of its release, but after his initial rejection of the sale is not significantly increased, and its production was discontinued in 1988. This car was produced from 1982 to 1988 and, although over time gradually moved away from the Cavalier farther, not only did not become popular, but also caused significant damage to the image of the prestigious brand. Originally we planned to introduce a new car for 1984, but a panic situation in the market (with gasoline prices catastrophic predictions of growth) has forced the corporation dramatically accelerate the development of Cimarron. In this regard, the then president of General Motors Pete Estes warned the general manager of "Cadillac" Ed Kennard: "you do not have enough time to rework J-car" Cadillac "," appear to be alluding precisely to the highly successful masking of the original platform in Seville - on it it was spent a lot of time, which did not have to repeat the Cimarron creators waste plan. And so it happened: Cimarron '82 was presented May 21, 1981 - just two months after the public announcement of the first J-body (Cavalier). And the differences between the most affordable in its class American cars were not too significant. Technically Cimarron different from other cars only in the presence of hydraulic stretcher pads for improved ride and handling on this platform. Interior with leather seating really carried on "kadillakovskom" quality level, but with the exception of the extended instrument panel with tachometer, of materials used, improved noise reduction and quality of the finish was very similar to Cavalier'ovsky. However, the proposed optional sunroof «Vista Vent» type, is not available on other J-machines. The worst part was that the engine and transmission are not entirely consistent with "Cadillac" standards. Although GM certainly can immediately offer to Cimarron V6 (under the hood there is enough space), this was not done and the machine supplied in 1982 model year with a dull carbureted 1.8-liter four-cylinder OHV. For the first time since 1914 "Cadillac" engine offered with the number of cylinders. Although Cimarron project was profitable for GM, its appearance is considered to be one of the causes of the deep "Cadillac" of the crisis in the late '80s, almost went bankrupt a division of the corporation. 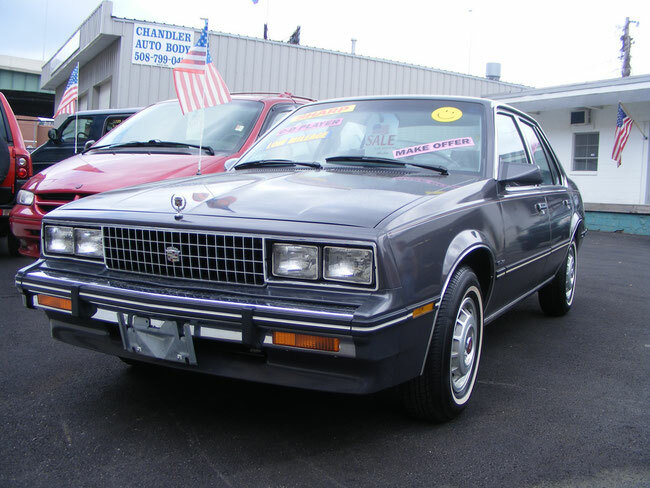 It is not only the image - Cimarron for many customers was the last acquired a Cadillac, so uncomfortable was their feeling of «Cavalier for double the price." All J-body were front-wheel with a monocoque body, had a wheelbase of 2570 mm (up to 1995) and an identical structure Suspension: MacPherson strut front and torsion beam rear. The front suspension, engine and transmission were mounted to the subframe. Motor located transversely over the front axle. Overall - a typical pattern for this class of machine. In addition, it is absolutely all the cars produce up to 1989 based on the J-body, have a common central part: the roof, doors and windows on machines with the same type of body (eg, sedan) are interchangeable. Accordingly, the domestic interior dimensions also coincide completely, although the interior design differed. The main difference lies in the design decisions the front and rear parts, and here the developers have distinguished a considerable variety of visual aids, so often in the machines can be considered "family" only on the window line. Of course, elements such as moldings and design rims were also fundamentally different. Another low point in the early 1980s was the variable displacement engine released under the label L62 V8-6-4. Introduced in 1981, this 6 l (368 dyuymov³) engine to selectively connect and disconnect cylinders respectively required power. Machines are equipped with V8-6-4 often eventually returned to dealers was disabled with the engine electronics, causing them to work as usual V8 engines. V8-6-4 was in the next year removed from all models except the Fleetwood limousine in favor of immediately launched into the production of a family of smaller aluminum V8 engine. 4.1 L (≈250 dyuymov³) HT-4100 engine has been widely used in Cadillacs from 1982 to 1987. Most HT4100-x, have failed without passing and 60 000 miles (97 000 km) and many of the one million HT4100-X is installed on Cadillacs in 1982-1987 were replaced by the manufacturer warranty, although, with proper maintenance, the engines often were far more miles with less problems or no problems. HT4100-s problems were far less severe and frequent than those that were only released one year V8-6-4 and nevertheless cost "Cadillac" loyalty of many customers. In 1988, the "Cadillac" introduced 4.5-liter V8 engine with an aluminum cylinder block, proved to be very reliable, often these engines look good after more than 250 000 miles (400 000 km) run. This powerplant was boosted to 4.9 liters in 1991 and was produced until 1993. The famous Northstar V8 was installed in stages [to El Dorado] and became the main powerplant lineup "Cadillac" 1993 model year for the next decade. In 1990 of the company was awarded the award for the quality of the Malcolm Baldrige National Quality Award. "Cadillac" was the first automotive company to receive the Baldrige National Award, and until 1997 was the only car manufacturer to be awarded this assessment. In 1992, it has undergone significant changes Eldorado and Seville have received worldwide recognition. Along with other awards Seville won the prize "Car of the Year" magazine Motor Trend. A year later, Seville got up for one more step, getting Northstar engine. Recognized as a leader, the Northstar system provides drivers with unrivaled levels of ride quality, handling and reliability. In 1993, he was completely changed the appearance of the model Fleetwood Bruem. "Cadillac" continued the glorious tradition of being a favorite base for a stretch limousines, including vehicles for US presidents. In 1996, the Northstar engine capacity was increased to 300 horsepower (the Concours on the cars the DeVille, the Eldorado the Touring the Coupe, the STS Seville You. In 1997 Seville STS models, Eldorado Touring Coupe and DeVille Concours appears exclusive security StabiliTrack. In addition to this "Cadillac" changes the design of the car DeVille, introducing a new modification - d'Elegance. This new creation "Cadillac" joined a special American style with modern technical equipment and high level of comfort. All cars DeVille appeared side airbags. Cadillac Catera - the smallest model of the upper class, was also released in 1997. 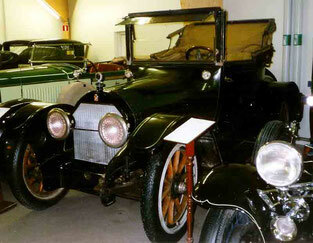 The size reduction and "Bruem"
Models Cimarron and marked the beginning of Sevilla Car "smaller" in-line "Cadillac". In the 1980s, American automakers have reduced most of its models, and Cadillac was no exception. 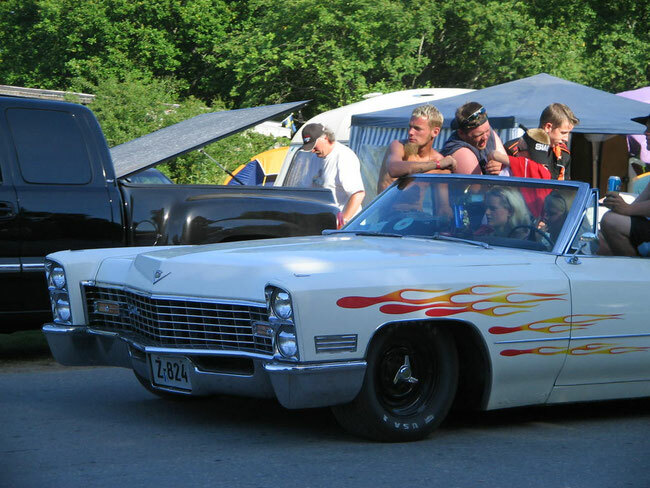 By the end of the 80s, it was the only model Bruem "Cadillac", which has maintained the style and size of the "large" and DeVille'ey Fleetwood'ov 70s. In 1993, the Brougham was redesigned and renamed the Fleetwood, with an additional package Bruem, towing capability with engine L05 V8 - up to 7000 pounds (3200 kg). In 1994, "Cadillac" L05 engine replaced with new, more powerful engine LT1. Fleetwood was withdrawn from production after the 1996 model year. After leaving Fleetwood, Lincoln Town Car was the only traditional full-size car class "lux" in the US market. From 1997 to 2001, the proposed model Cadillac the Catera, almost literally copying method of creating Cimarron: was taken Opel Omega MV6 with a 3-liter V6 and is complemented by numerous "de luxe" options and emblems "Cadillac" and impressively reworked rear part in a purely American style . The car itself, in fact, is also produced in Germany, together with Omega and imported into the United States. After GM gradual withdrawal of platform D in 1996, the "Cadillac" was the only front-wheel drive lineup except presented in 1997 at the European Catera chassis. Escalade based on the GMC Yukon Denali, the first SUV (English Sport Utility Vehicle -. A practical sports car) "Cadillac", it was introduced in 1998 for the 1999 model year and distinguished by a standard all-wheel drive. He was quickly taken to immediately capitalize on the market success of the Lincoln Navigator, released as a 1998 model and is apparently intended to push the total number of sales of the brand "Lincoln" in 1998 calendar year, far ahead of the "Cadillac". By November 1998, the leadership "Lincoln" for the year 6783 was a class "luxury" cars, but reports on the December sales "Cadillac" reported on the implementation of 23 861 machines, more than 10 000 more than in comparison with November sales. A notable part of this growth was an increase Escalade sales from 960 in November to 3,642 in December. The result was the general leadership of the brand "Cadillac" of only 222 cars. Subsequent audits of sales records in the first quarter of 1999, caused by an unusual amount recorded at December, and the fact that Escalade sales in January 1999 fell to a pitiful 225 cars, have led to the discovery of the "errors" in the 4773 units. With this correction, it meant that "Lincoln" is actually ahead of "Cadillac" in the total sales volume of the 1998 calendar year (187 121 sold by Lincoln, against 182,570 Cadillacs). In the first week of May 1999 we were issued a public confession and apology to the representative of GM Jim Farmer, recognized that the cause of elevated results were "a combination of internal control deficiencies and excessive fanaticism on the part of the members of our team", and added that those responsible were disciplined. However, no one firm had no reason to celebrate a commercial success in the US market class "luxury" cars, because of their previous position number two and number one seized the Japanese and German brands. At the end of 2001, the model was replaced by a new Catera sedan small CTS. The premiere of this "compact" sport sedan model year 2002 was held at the Motor Show in Frankfurt am Main. Complete compact Cadillac CTS in its own rear-wheel drive platform Sigma - the car is entirely consistent with the current direction of development of the brand and well sold. In 2001 model year has been updated due to the new SUV Escalade II generation. 2-door coupe Eldorado at the end of April 2002 was withdrawn from production due to low demand. Cadillac resisted the trend towards producing "retro" models such as an updated Sandebёrd Ford or Volkswagen New Beetle. Instead, promoted the new design philosophy of the 21st century, called "the art and science» ( «art and science», «A & S»), who said "the connection of solid lines, severe bends and sharp corners - form language, expressing energetic, high-tech design and ensuring its implementation technology. " This new design language spread from the original CTS across the model range, right up to the XLR roadster. The lineup includes Cadillac predominantly posterior and all-wheel drive sedans, roadsters, crossovers and SUV. The only exception - front-wheel drive Cadillac BLS (which is not sold in North America) and the Cadillac DTS. Many of these models are actively compete with respected machines upper class "luxury" segment, German and Japanese manufacturers. The flagship of this success is the CTS-V second generation direct competitor vaunted BMW M5. CTS-V version with automatic transmission went round the Nurburgring in 7: 59.32, a record time for a mass-produced sedans. Although the invention Cadillac again, with the brand of the company before the end of the decade worked a little because of the bankruptcy of General Motors. A number of top models on the basis of the concept car Cadillac Sixteen (Cadillac Sixteen) was canceled, along with the replacement of the engine Northstar (Northstar). Since the production of the Cadillac STS and DTS models scheduled to be completed, Cadillac is still without a decent top-end model. The development was a small rear-drive sedan, but on the basis of the reports, it is expected that he will move to the Epsilon II platform and will take a position lower than the number of the Cadillac CTS. However, Cadillac began the development of the second generation Cadillac SRX in 2009. The SRX is based on the Theta Premium platform and is offered in both front- and all-wheel drive variants. It also reported that in 2014 Escalade will move to the Lambda platform, but by that time it may be that Cadillac will continue its body on frame architecture with a redesign in 2013. Cadillac on the Lambda platform will be put into production to complement the next Escalade, which may It is more expensive than the current model. In 2010, Cadillac exhibited concept car XTS Platinum and announced its intention to release the front and all-wheel drive sedan on the platform Super Epsilon. Also, in late 2009, General Motors has announced that the upcoming competitor to the BMW 3, Cadillac ATS, will be put into production in the posterior and all-wheel drive Alpha platform in 2013. Reports have revealed that GM has given the green light, not only rival BMW 7 Zeta platform, and any other concept, on the same platform is based on the concept Cadillac Sixteen. Reports suggest that the latter will receive a price tag of up to 125 000 USD, and will be positioned as the crowning achievements of the Cadillac. Also found that following the CTS, scheduled for release in 2013, will move to the long wheelbase version of the forthcoming time Alpha platform. Expected increase in cost and weight, as well as the loss of a coupe and wagon variants. It follows that by mid-2010. Cadillac will leave the production of a full range of vehicles. Over the years, the Cadillac was a symbol of American success and the American dream. Today there is no difference between the new model represents a Cadillac, like, CTS-V, the fastest sedan in the world of mass production, and many other world-class car. With the 1950s. after the iconic Cadillac Eldorado, Cadillac became synonymous with American complacency and absurdities in automotive design. 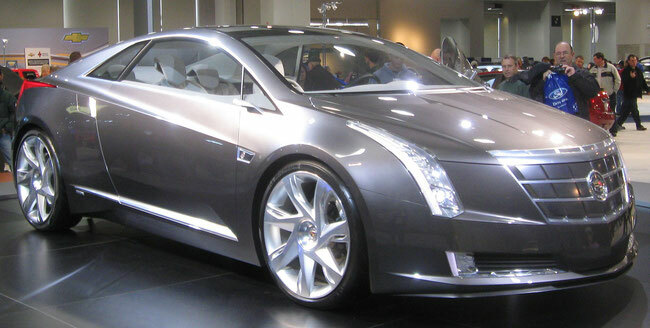 Most car-like proportions of the external design of the CTS coupe, can usually be found only among the concept cars. Together with the changes in American culture in the 21st century has changed the style and design of the external form of the Cadillac, which the company called "design art and science." Reflection of Cadillac Art and Science can be seen in such concepts as the Sixteen and Konverzh (Converj). Style can be seen even in mass-produced cars such as the Cadillac CTS and SRX 2010 Cadillac year. 1957 - Cadillac Director, "Bubble-Top"